Your adverts and other marketing efforts are not the beginning and end of your overall marketing system. Every campaign should ideally have a full set of components including Audience Selection, Marketing Magnet, Landing Page or physical call/visit, Conversion Action, Follow-up, and Ascension. In addition, Split Testing, Conversion Optimization, Remarketing/Retargeting, Reporting, and Optimization. With every service, we work on building out the whole funnel, end-to-end with the appropriate components. Our services cover 4 main areas: attraction, conversion, retention, reporting and optimization. Attraction deals with the promotional aspects of your marketing campaigns. It includes ways of getting your message to your market and attracting prospects into your marketing funnels. The following services fall completely or partially within attraction: Pay Per Click Management, Facebook Advertising, Content River, Mobile Marketing, Websites, Search Engine Optimization, Around Us (Local Marketing). Conversion is the process of turning prospects into leads, customers, clients, and patients. The following services will assist your business with conversion: Conversion Optimization, Around Us (Local Marketing), Call Tracking. Retention includes the process of marketing to existing customers, the reacquisition of previous customers, and the systems required to handle both. To build a retention system, we begin by ensuring that a system to capture customer details is in place. Most of our attraction and conversion services include this. We then incorporate technologies such as e-mail databases and retargeting to handle campaigns. 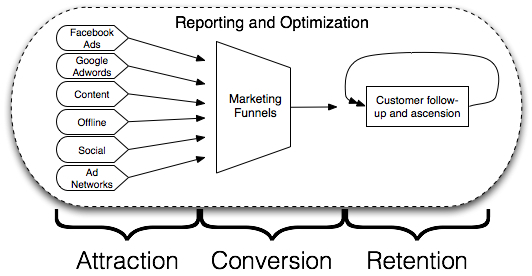 Reporting and optimization ties the entire marketing system together. We use the reporting to identify areas for improvement and to ensure their campaigns are being carried out successfully. We use reporting and other tools to identify and test areas that can be optimized. While we do split our services into different categories, our intention is to build a complete end to end marketing system for your business using all the tools at our disposal and bringing continual optimization to the process of growing your business. We only take on a limited number of clients each month to ensure we can focus fully on bringing all our skills, experience and tools to bear on making a real difference. Book a no-obligation consultation with us today by calling us on +1 (877) 752-0852 or sending us a message from our Contact Us page.